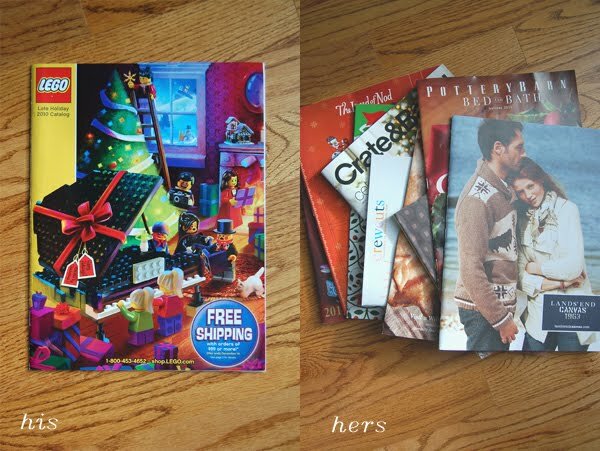 His + Hers: catalogs we get. Q is loyal only to the Lego catalog. And then there's me, who pretty much subscribes to every catalog available (plus, they work great to recycle as wrapping paper). I am just like you Alli and subscribe to far too many catalogues - this time of year is crazy and my postbox is guaranteed to hold at least one each day. I hope to join in next week with your great his/hers idea. Such a fun idea and I'll be linking next week. my catalogs pile looks a lot like yours, but i must admit i'd sneak a peek at the legos too!